Get paid for every listen you get through the RadioPublic apps for iOS and Android. A custom podcast website designed to increase your listenership. Our free web player is designed to convert a casual web visitor into a regular listener to your show. Works for any podcast, on any device, anywhere in the world. RSS feeds, podcast hosting, dynamic ad insertion, oh my! Our simple step-by-step guide will make the process less daunting. As you begin making your show, our tips and tricks amp up your podcast so it looks (and sounds) good everywhere it appears. Increase your podcast listenership with tactical and measurable approaches to podcast marketing. Prepare your podcast to earn money from advertising, listener support, and more. 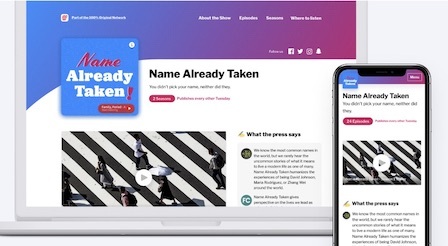 We are RadioPublic, a Public Benefit Corporation founded in 2016 that helps listeners discover, engage with, and reward creators of stories, podcasts, and other audio. Our founding team helped build PRX, and with RadioPublic, we expand upon a 15 year track record of distributing audio content and paying independent radio producers and podcasters. Whether you’re at the idea stage or your podcast is poised for growth and revenue, we can help.